Mr. W was complaining about the appearance of his front teeth. 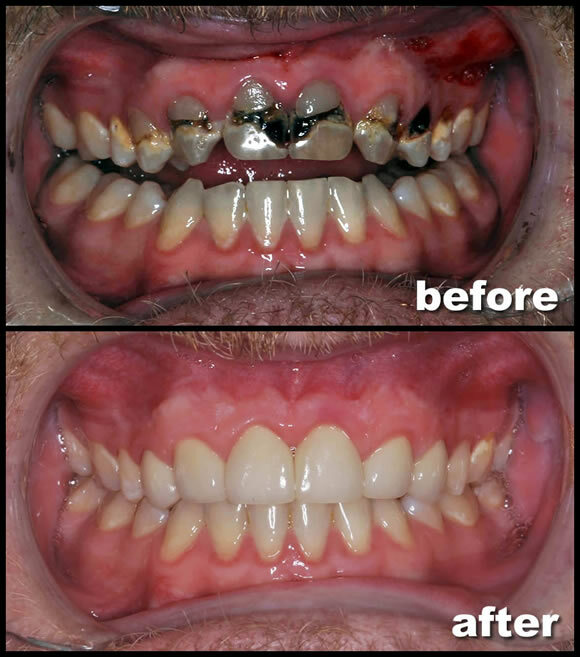 “Since I had my braces taken off, my teeth have become discolored and seem to be chipping away,” he said. Clinical evaluation showed black and brown areas on his upper front teeth. Some teeth had deteriorating fillings along the gum line, and others had cavities on the front surface. Given the extent of decay and decalcification, Mr. W was a good candidate for all porcelain crowns (as opposed to porcelain veneers). The result is fresh and clean. He was extremely satisfied to have white teeth again, and he no longer feels embarrassed about his smile.